Search2000.com is the PUP that uses misleading techniques to prevent removal. Use Reimage to locate malicious components and get rid of them faster than with uninstall instructions. A full system scan blocks virus reappearance and prevents traffic to malicious domains. Search2000.com is a useless search engine that does not perform its primary function properly. Indeed, using this search engine, you won’t be able to find necessary information. At the moment of writing, this tool does not deliver any links in the results page. However, it still can hijack your web browser. So-called Search2000.com virus is a potentially unwanted program (PUP) which acts as a browser hijacker. It spreads in software bundles and might hijack inattentive computer users' web browsers. The hijacker is compatible with Google Chrome, Mozilla Firefox, Internet Explorer or other popular web browsers. Once this PUP is installed, it might alter browser’s settings and set its domain as default search engine or/and homepage. Additionally, you might notice an increased amount of online ads that offer to download suspicious software. However, after Search2000.com hijack, you should be extremely careful with online ads and avoid clicking them because they might be malicious or lead to phishing sites. The problem is that developers of Search2000 present itself as a “global leaders in search engine marketing and web traffic generation,” meaning that they might help companies to drive traffic to their websites. The company specializes in online advertising, so their created search engines or browser extensions are used for commercial purposes. 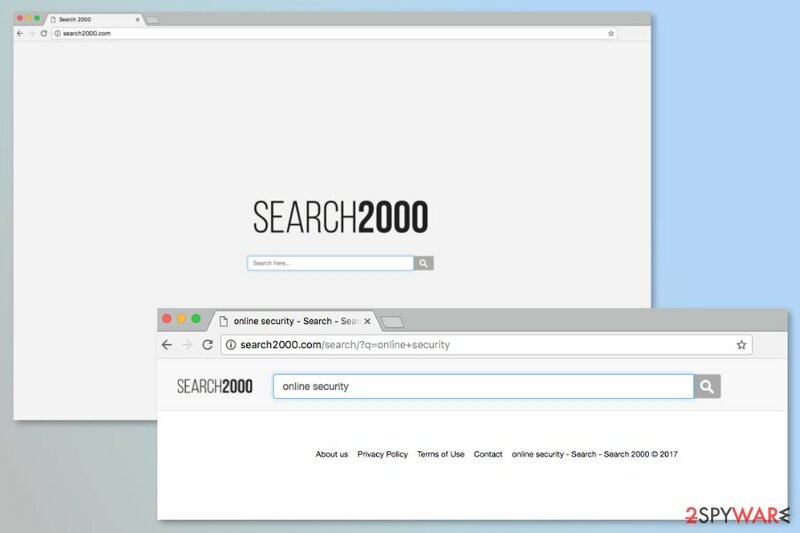 Thus, if you do not want to get tricked by some personalized and suffer from scammers, you should remove Search2000.com from your computer. As we have mentioned, this search engine does not function properly. So, there’s no need to keep it. We highly recommend for Search2000.com removal choosing Reimage or another anti-malware tool. It’s the quickest method to get rid of PUPs and all their components. However, if you want to wipe out this cyber infection manually, you can find elimination guide at the end of the article. Search2000.com is a suspicious website that might replace your default search engine after the incorrect installation of freeware. If you download freeware or shareware, you always have to make sure that it’s a single program, not a bundle. Free programs often include “optional downloads” that are usually browser hijackers, adware and other PUPs. Thus, it’s better to stop their installation. The only way to prevent installation of third-party apps is to choose Advanced/Custom installation settings instead of Quick/Recommended. If you find a pre-selected statement saying “I agree to make Search2000.com my default search engine” or third-party apps, remove the ticks to stop their installation. 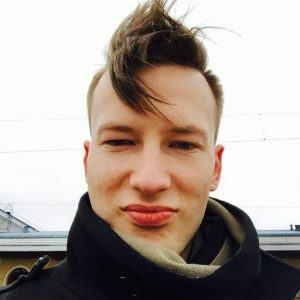 Security experts from Estonia do not recommend replacing your current search provider in this way because often you are tricked into using questionable search tool that might pose a danger to your privacy. In order to remove Search2000.com manually, you should follow the guidelines below. Keep in mind that you have to uninstall suspicious programs from the system as well as unknown browser extensions from each of the browser. Additionally, you have to reset affected browsers too. However, you can speed up Search2000.com removal with reputable anti-malware/anti-spyware. If manual removal guide seems hard to follow, you should obtain reputable tool and run a full system scan. Here, look for Search2000.com or any other recently installed suspicious programs. Wait until you see Applications folder and look for Search2000.com or any other suspicious programs on it. Now right click on every of such entries and select Move to Trash. When in the new window, check Delete personal settings and select Reset again to complete Search2000.com removal. Once these steps are finished, Search2000.com should be removed from your Microsoft Edge browser. Here, select Search2000.com and other questionable plugins. Click Remove to delete these entries. Now you will see Reset Firefox to its default state message with Reset Firefox button. Click this button for several times and complete Search2000.com removal. Access Chrome's extensions and remove all questionable extensions. They might be protecting the hijacker. Browser reset is recommended too. Here, select Search2000.com and other malicious plugins and select trash icon to delete these entries. Click Reset to confirm this action and complete Search2000.com removal. Here, select Extensions and look for Search2000.com or other suspicious entries. Click on the Uninstall button to get rid each of them. Here, look at the Homepage field. If it was altered by Search2000.com, remove unwanted link and enter the one that you want to use for your searches. Remember to include the "http://" before typing in the address of the page. Now you will see a detailed dialog window filled with reset options. All of those options are usually checked, but you can specify which of them you want to reset. Click the Reset button to complete Search2000.com removal process. ^ Marie Cartwright. How to Know if Someone Hijacked Your Browser. Chron. Houston news, sports and entertainment. ^ Chris Hoffman. PUPs Explained: What is a “Potentially Unwanted Program”?. How-to Geek. Provides explanation about technology. ^ Virused. Virused. Estonian cyber security news and malware database. This entry was posted on 2017-10-18 at 08:54 and is filed under Stealing programs, Viruses. You can quickly scan the QR code with your mobile device and have Search2000.com virus manual removal instructions right in your pocket. How did you remove Search2000.com virus?